The myLboro app is a digital guide to Loughborough University London. If you haven’t already got the app, here’s 5 great reasons why you should download it now! 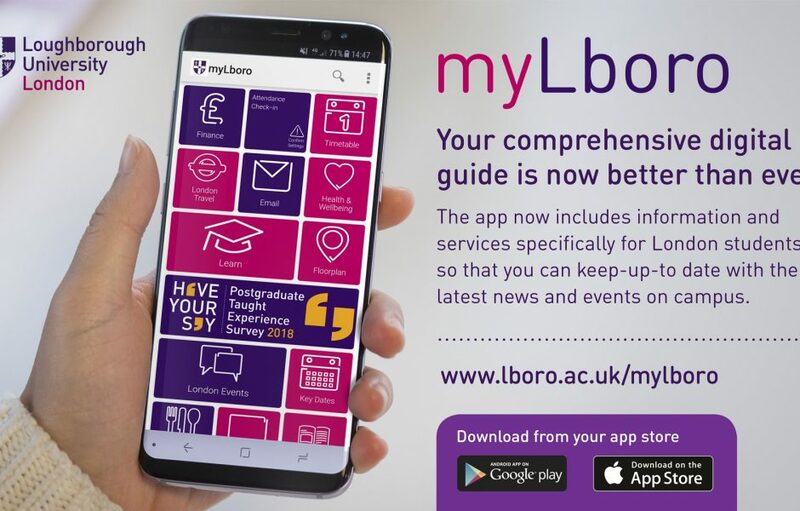 The myLboro app is designed to help students, staff and visitors keep up-to-date with news, information, events and a range of services going on across campus. This will ensure you do not miss out on the opportunity of attending an event or miss key information because it will be on your myLboro app. Once teaching starts, students will need to register their attendance via the app. The app also has a direct link to Learn which means students’ achievements and progress can be accessed quickly and easily at any time. The myLboro app takes seconds to download and install, as well as being easy to set up as either a guest, student or staff user. The myLboro app has live travel information. It includes live updates across all major travel routes including buses, rail and tube lines passing Stratford International and Stratford City stations. This will make travelling to and from Loughborough University London’s campus easier for you. London has one of the most diverse and exciting cultures in the world. If you come to study here you will be able to explore London and see all the top attractions. Our app offers a London city guide which will help you find top things to do nearby, as well as the entire London area. The myLboro app is available to download now from both the App Store and Google Play. Some of the content mentioned above is only available to registered students and staff. If you are due to commence your studies with us this September, you can access this additional content one you have been issued with your University username and password.